The above is a portion of a cover letter I sent to a neurosurgeon last week, along with copies of the films and results of my MRI (on a 3.0 Tesla, W/WO contrast) that showed a 5x5x6 mm adenoma on my right pituitary gland. I’ve been cortisol testing for nine months with mostly elevated, but not outrageous results. The neurosurgeon personally called me within 3 hours of receiving my package and agreed I do have an ACTH secreting tumor that needs to be surgically removed. He’s tentatively scheduled surgery for Nov 26th, the day before Thanksgiving!! Pinch me, I’m dreaming!! It’s incredible this happened so quickly when so many of my Cushie comrads are still waiting for a diagnosis years into their disease. I must give credit for my success to sites like yours that provide education and incredible information, stress the importance of being your own advocate by taking matters into your own hands, being totally prepared for your doctor’s visits; speaking their language (in medical terms); immediately dumping those who aren’t effective, believing or productive; seeking out the most qualified and preparing your presentaion as if you were an actress auditioning for the lead in a movie!! It should include your “resume”, before-and after-photographs, all test results to date, a brief out line of symptoms and when they occured. I hope you’ll be as fortunate as I was!!! I promise to keep you posted. Thanks for your encouragement and prayers. I’ll be in recovery one week from today!! Happy Thanksgiving, everyone…. If anyone has knowledge of how long it takes to feel better after BLA, please advise. I’ve had unusually difficult setbacks since surgery. This web site has helped a lot so far.. I have had high blood pressure that has become harder to control for 11 years. Ultra sound did not show anything. Many other symptoms increased over the years, including diabetes, body shape, hump etc. 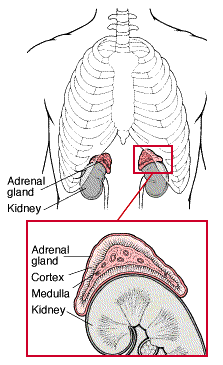 In feb. Of ’09 a ct showed a tumor in both adrenals. I was able to get into the mayo clinic and was diagnosed with cushings and had surgery on 4/10/09. One week later, my bp dropped, to 30 on the diastolic . My face hit the floor when I fainted. I had to be air lifted out. I received a concussion and broken nose. On 6/12/09 I had my nose operated on and a cyst taken out of my lip. I’m on my maintenance dose of hydro (20/10). How long before I feel better? Diabetes improving. Blood pressure still high.